-- Select a Size/Color -- One Size - 7"
Give your pet a plush emoji to show them how you feel with the 7" D.O.G'z I Love You Dog Toy by PetLou. 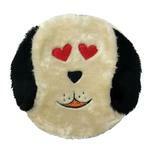 For dogs that want to know how you feel, the 7" D.O.G'z I Love You Dog Toy by PetLou is squeak-a-licious! This plush disk dog toy is in the shape of an emoji and is filled entirely by a giant puncture-proof squeaker. This means your pup will experience squeaking joy every time they mouth this fun toy.